Super Hero Boy: The monkey just smashed that guy's fingers!! The monkey just smashed that guy's fingers!! Connor has a new favorite movie. Night At the Museum Battle of The Smithsonian. This is actually the second movie from the series and though we loved the first movie, I have to tell you the second movie in many ways is my favorite movie of the series. If you never saw Night At The Museum, shame on you, go rent it right now. It's a great film if you have kids or not but seriously little kids will be absolutely amazed as the exhibits in the museum come to life. The whole premise of the movie is that there is a magical Egyptian tablet located in the museum that has the power to bring things to life, this means all of the exhibits inside the museums suddenly become alive and even inhabit the personalities of the people they were meant to represent. The main character in the first movie is the new night guard who is totally unaware of this before he starts his job and he has to learn to adapt.. quickly. In the second movie the night guard has moved on to his own company but comes back to visit his night time friends often only to find out that his friends are being shipped out to storage at the Smithsonian as they are being replaced by digital exhibits. The only problem with this is that if they are moved from the museum they won't come to life every night anymore. Though they don't realize it the monkey ends up stealing the tablet and brings it with them to the Smithsonian which in turn brings the largest museum in the world to life that night and lands the group in some major trouble with an Egyptian pharaoh who really wants the tablet to bring to life his undead army. Connor usually only takes interest in cartoon and animated movies but the moment he saw that monkey come to life and smash Ben Stiller's fingers in a crate he was talking about it nonstop. A combination of CGI and camera tricks makes everything from the toy soldiers to the bobble headed Eisensteins come to life and everywhere you look once they hit the Smithsonian something really awesome is walking around in the background. My absolute favorite that cracks me up every time we see it is a massive metallic red balloon dog that hops around in the background at the museum. I'm not sure why but he has to be my favorite of all the background characters. All in all though the movie is really entertaining though the plot is not so much one that an adult will want to see it a zillion times though personally I've seen it at least six times in the last week and I still enjoy watching the craziness going on. Children on the other hand will be amazed and be prepared to leave it in the bluray player for a few weeks on repeat. Night at the Museum Battle of the Smithsonian is available in a bluray/standard combo pack which is HIGHLY recommened. Actually with as many special effects that were used in making this movie its almost a shame for you to see it for the first time in any other format than bluray. It's really impressive and the sound affects are almost as impressive as the graphics. However with that said its always a huge bonus to get both the standard and bluray copies as Connor likes to keep his standard copies in his room for bedtime viewings. As for the extras, wow... um.. where do I begin? There are more extras included than I can talk about in a short amount of space. Some of our favorites included a scavenger hunt game, a special on the monkey that stared in the film (Connor's favorite! ), and a tour of the Natural History museum. Actually this entire movie makes me want to take a trip to the Smithsonian asap! 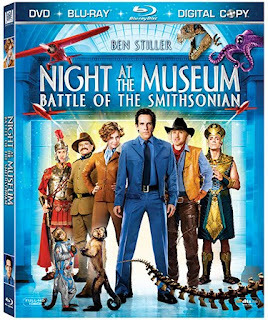 Regardless if you have seen the first movie or not, Night at the Museum Battle of the Smithsonian is a MUST own for families with kids or just anyone who wants a good laugh! You can pick up your own copy in bluray/standard combo pack on Amazon!